The Swiss company was set up in 1970 by Thomas Egloff. From the very outset, Belux was prepared to take the risks associated with experimental innovations. A major breakthrough came in 1982 with the joint development of Metro, the first low-voltage cable-track lighting system in the world. In 1996, Belux brought the variable lamp UPDOWN onto the market, a genial design from Reto Schöpfer, and this established the energy-saving fluorescent lamp in the private residential market. METER BY METER, with its light which can be tailored to individual requirements, also set new standards. Belux is currently creating a stir in the light market with designers such as Frank Gehry, Herzog & De Meuron, Ronan and Erwan Bouroullec as well as Hella Jongerius. 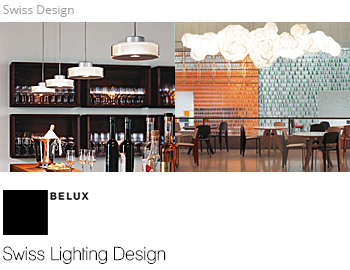 As ever, Belux stands for conceptually mature, technically sophisticated and durable quality products and keeps in the public eye by introducing new materials and technologies.